It turns out that escaping from prison is hard, much harder than TV, movies and numerous games had led me to believe. You can’t simply hide in a laundry hamper or tunnel under the walls with a spoon because guards tend to notice that sort of thing, put a stop to it, confiscate all your stuff and lock you in solitary. 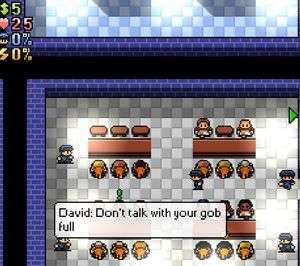 The Escapists is, as the name and introduction may suggest, a game about escaping from prison without getting too much of a shoeing from the guards. Taking control of your orange-suited avatar, you must acquire or craft the tools you need to plan and enact your masterful escape from the maximum security facility in which you are incarcerated. The build that I played only features a single prison to escape from, but more are promised for the release version, along with a prison editor so that you can create your own inescapable death-traps for other players to try and conquer. The prison operates on a strict schedule and the guards will quickly turn on you if they find you trying to sneak off and do your own thing when you should be showering or eating dinner. You can take on any one of a number of prison jobs that will earn you money and give you access to certain tools and materials that might be helpful in making your escape, though smuggling them back to your cell is not always straightforward. You can also perform favours for other inmates, which will earn you money and improve their disposition towards you; these range from simple fetch quests to distracting the guards during dinner to dishing out beatings to unsuspecting individuals. In your free time you can choose to run, lift weights or read in order to improve your Speed, Strength and Intelligence respectively. These stats affect which jobs you can take, which items you can craft, how much HP you have and how hard you hit as well as, obviously, how fast you can move. Stats decay over time, so you have to continuously train them just to stand still, which further limits the amount of time you have to plot your bid for freedom. 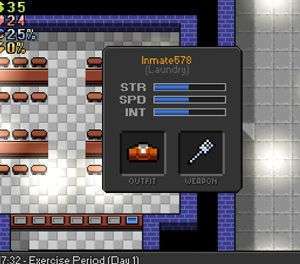 You can carry a small number of items with you as you wander around the prison, along with a weapon and your clothing, and store a moderate number in your cell, although contraband items will, often inexplicably, set off metal detectors and alert the guards who will attempt to apprehend you. Additionally, the guards will periodically toss your cell and confiscate any contraband they find, making it very difficult to maintain a stash of useful tools for any length of time, though you will usually have advanced warning of it happening. Finally, doing anything to upset the guards, such as getting caught stealing, beating up another inmate or even attacking the guards themselves will result in you being sent to the infirmary, having any contraband you’re carrying confiscated and losing some of your money. Oddly, your currently equipped weapon is not taken from you, though this may be a bug. There is a journal which tracks your current “quests” (favours for other prisoners) and is supposed to track crafting recipes as well, but in my playthroughs it never did, meaning I had to record them the old fashioned way on some actual paper with an actual pen. You can drop accepted quests without any obvious penalty if you decide they’re more hassle than they’re worth, and there appears to be a limit of five quests that you can take on at any given time; some of them can be pretty hard to complete so it’s something you may find yourself doing fairly regularly. During my numerous failed escape attempts I found that the guards were just a little too sharp for my liking, very quickly spotting any evidence of an escape, from a loose vent to a covered hole in the ground to a guard’s key going missing. In fact, the one time I actually starting making progress escaping through the vent system a randomly roaming guard walked past my cell door and suddenly I was in solitary, the vent was re-secured and all my cool gear was gone. The harshness with which you are punished for mistakes, most of which you have no way to see coming, gives The Escapists a very roguelike feel, only without the random level generation. The game automatically saves once a day when you go to sleep, or when you’re banged up in solitary, and there’s no manual save option, meaning that you can’t quicksave your way around trouble – once you’ve been rumbled there’s no going back. While you aren’t forced to restart after a failed attempt, and you maintain your reputation, stats and some of your money, you are still very much back to square one in terms of an actual escape. I enjoyed my time with The Escapists and it certainly has a great deal of promise, although right now it’s a little too opaque and the failure conditions a little too strict for me to really get into it – thankfully it’s got a long way to go before it’s finished. 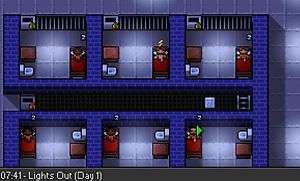 The Escapists is being developed by Mouldy Toof Studios and published by Team17 Digital; it’s due to launch on Steam Early Access in the near future and has a very rough final release target of “mid to end 2015″. Tags: Cooler King, escape games, escapes, indie games, Mouldy Toof, not much of a Great Escape, prison breaks, prison games, strategy, Team 17, Team17, The Escapists, Two hundred and fifty guys just walking down the road just like that, What do they call a mole in Scotland Ives?, where's Arnie?